If you’ve read predictions about the future of Online Marketing over the past 3-4 years, you’ll undoubtedly find “mobile” mentioned in each one. For example: Mobile ecommerce is predicted to increase 65% annually through 2015. With smart phone sales to pass personal computers, the smart phone race between AT&T and Verizon iPhones, Droid powered phones and everyone else, the impact of mobile devices on our daily lives has elevated to unprecedented levels. 2011 may finally prove to be a breakout year for mobile marketing and mobile commerce. Mobile Marketer – Let by Editor in Chief Mickey Alam Khan and a great team including Giselle Tsirulnik and Dan Butcher, this publication covers 360 degrees of mobile marketing and commerce. Another useful mobile marketing news site is Mobile Marketing Watch, which offers a variety of news on the mobile space and is a great example of content marketing from it’s owner, mobileStorm. Mobile Marketing Association – The MMA is a global organization headquartered in New York with over 700 members and a charter to promote, educate, measure, guide and protect the mobile marketing industry worldwide. The MMA also hosts 5 global forum events each year called the MMAF (Mobile Marketing Association Forum) in Singapore, New York, Sao Paulo, London and Los Angeles. Google Mobile Ads Blog – With the acquisition of AdMob, Google’s mobile advertising resources have expanded significantly and this blog provides great insights into the world of mobile advertising. Also check out the companion Google Mobile Blog. 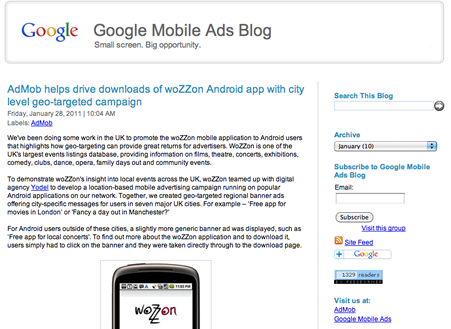 Another hand mobile advertising blog worth checking out comes from the folks at Mobivity. The Marqui blog recently curated a nice collection of PowerPoint decks on Mobile Marketing like the one above covering future trends and innovation in mobile marketing and advertising. Also check out DMA Retail Roadmap to Mobile Marketing- a presentation by Joel Morrow of Mobile Fusion giving numerous case studies and best practices for retail mobile marketing. 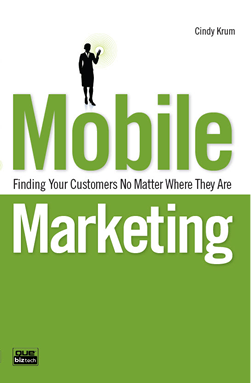 Finally, here is “the book” on Mobile Marketing, written by Cindy Krum. “Mobile Marketing: Finding Your Customers No Matter Where They Are“. Getting this book is a no-brainer if you want a great foundation for mobile marketing as part of your online marketing mix. There are many other resources including research reports, but few of value are available without requiring registration, so we can’t link to them directly. What are your favorite newsletters, blogs, events/conferences and resources for mobile marketing and advertising? Would you like Online Marketing Blog to cover more mobile marketing topics, tips, interviews and best practices? Marketing tips would be a great addition to your regular features. There’s always something new to learn regarding online marketing, and I’ll bet most of your readers would appreciate the more thorough coverage of the topic. Feedback appreciated David – mobile is one of those areas we’ve touched on but do not get deep into. I made my first WAP site in 2000 🙂 but didn’t do too much after that. Brain cramp – missed including Cindy Krum’s book – just added. Maybe it was because she turned down my editorial offers – twice? Ha ha. No, it was an oversight due to a rushed post. It’s a great book. I always think Steve Smith from Mediaposts’ Mobile Insider is right on the money. I’d also consider Kim Dushinski’s Mobile Marketing Handbook. For podcasts, try the IM-Mobile or Mobile Beyond podcasts. For beginners, I recently did a presentation to the Newport Interactive Marketers group on mobile marketing that you can find on Slideshare http://www.slideshare.net/tamaragruber/intro-to-mobile-marketing-6653729. Thank you Tamara, I know this post was a bit short and there are many more resources. Thanks for the slideshare link! Thanks David, glad you find the post and info on our blog useful. We do plan to cover more mobile topics. Lee, this is both informative and timely for me as I just hosted a Chicago Booth Marketing Roundtable event last night featuring the topic of Mobile Marketing. I already forwarded this link to all of the attendees to give them even more info to use for their small businesses. Thanks for making this stuff available! I look forward to seeing more great Mobile content discussed here. Tamara, thanks for your Mobile Marketing suggestions too! The firm I work for is just starting to get around to developing mobile apps – about time. but are looking for something that’s a little more in depth in the actual quiz part. Any recommendations? Great post Lee. The future of online marketing is most definitely in social media an mobile marketing. Especially in major cities, people are constantly blocking out the noise of their surroundings and are plugged in to their smart phones through their commute. It’s the main mode of communication and their is a lot of space for marketing growth. Hi Cindy, I have just started reading your book a couple of days ago really good read, so interesting ideas and great information. This is a great set of materials and resources, thanks for putting it together! One area that doesn’t seem to get a lot of attention in this roundup is the changing nature of the conversation with your customers. With more brands creating mobile websites and mobile apps, how are they using those channels to talk to their customers? That’s a huge area of opportunity and seems to be a natural next step when investing in these assets. We’re seeing a lot of larger brands realize that they can reach a large and highly engaged audience of their customers through these channels in a personal way.